Until last year I spent my time in the city ducking in and out of cathedrals in which artists and popes were buried, marveling at the sculptures and paintings created by long-gone artists, and generally had an awareness that somewhere there must be actual a cemetery. In no place is this fact more beautiful than in the Anti-Catholic Cemetery. This small area near the Porta San Paolo – a tower-flanked gate in the 3rd century Aurelian walls – is one of the (perhaps the actual) oldest burial grounds in continuous use in Europe. It was established in the early part of the 18th century as a resting ground for the many non-Catholics who lived and died in the city. One of the names it is known by is the Protestant Cemetery, though Jews, Muslims, Zoroastrians, Buddhists, followers of Confucius, and Christians of many faiths are buried there as well. In fact, today it is known as The Non-Catholic Cemetery for Foreigners in Testaccio, Rome, and while I kind of like the original name best, I can see why it might have been problematic. So the question becomes, I suppose, why go there when there are so many other amazing and just-as-filled-with-dead places in Rome? 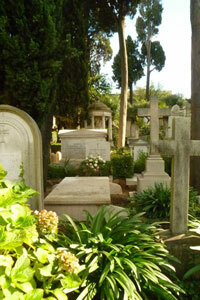 Why visit a place that admits to its hallowed ground only non-Roman Catholic foreign citizens who die while in Italy? And if you’ve never heard about it, doesn’t that mean it’s not likely to be worth the trip? 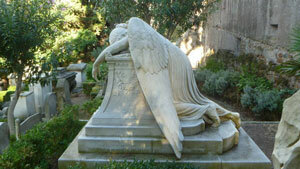 No less a person than Oscar Wilde called the Protestant Cemetery the holiest site in Rome – though chances are this was less because of its intrinsic holiness than because the famous English Poet John Keats is buried there. Then there was the poet Percy Bysshe Shelley who not long before he died in 1822 said of it “It might make one in love with death, to think that one should be buried in so sweet a place.” And if you need a bit of the macabre, Shelley’s ashes were subsequently buried here, but without his heart which found its way finally to his widow, Mary Shelley of Frankenstein fame, who kept it pressed in a book for almost 30 years. Or so the legend goes. Other famous dead include: the English author Edward John Trelawny who transported said heart to Mary Shelley and had himself buried beside Shelley’s ashes: the Italian philosopher and one of the founders of the Communist Party of Italy, Antonio Gramsci: German artist August Riedel who is entombed in pink granite; Italian atomic physicist Bruno Pontecorvo; the sons of German poet Goethe, and the above-mentioned Mary and Percy Shelley; American sculptor and one of the most prominent in Rome for 40 years William Wetmore Story; and American beat poet Gregory Corso. And this just skims the surface. This cemetery, as befits a final resting place in such a city, is filled with artists, scholars, writers of literature and poetry, architects and human rights activists, statesmen and sculptors, and the gravestones boast epitaphs in more than 15 languages, including Japanese, Russian, Greek, Bulgarian, and more. Still, that’s not the most compelling thing about this place. What becomes evident as soon as you enter through the tall gates is that this space, set aside for those whose faith set them apart in life, is somehow set apart from Rome through their deaths. It is smaller than you might expect, bounded by walls, a few buildings, and the Pyramid of Cestius – itself a tomb built sometime around 15 BC. There are a total of 2500 tombs in five areas, and yes it is crowded. 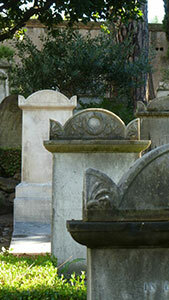 In the main area, tombstones are set so close together that squeezing between them can be a challenge, especially if you’re superstitious enough not to want to step just anywhere. Many of the dead are watched over by sculptures – angels mostly but other ethereal figures as well, and most as fine as any in Rome proper. 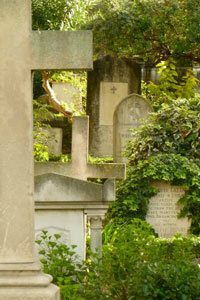 Cypress and other trees – almost 400 of them – and a profusion of blooming flowers seem to crowd in on each other and the tombstones in a way that feels less stifling than it perhaps should. The sunlight that finds its way to the ground glows on the marble in ethereal patterns, and the shadows are cool and inviting. Cats roam freely and are likely to approach to greet you, unless they’re busy chasing butterflies – and yes it sounds like a cliché, but it happens. The whole is set on a slight slope, so that stairs cut into the earth between graves take you from level to level in a kind of seamless journey through mismatched but somehow perfectly balanced stones. Some lean one way or another, but not as much as might be expected in a graveyard so full of weighty personalities. Another, less crowded area holds graves spread farther apart, and is open, grassy, with a wandering path and a few places to sit. Gravestones here are a bit unobtrusive, and it provides a great counterpoint to the density of the stones you’ve just come from. But return you must; the only way in and out of the cemetery takes you past those towering stones and magnificent sculptures. As you leave, take a moment to stand very still beneath the cypress trees and listen to the silence as you commune with those who lie beneath the earth. For this entire place is quiet. In the middle of Rome nowhere is quiet. Except here, it is. Inexplicable, maybe. Haunting and beautiful certainly. And you can almost hear the angels weeping. More information about Teresa Cutler-Broyles and her Tours to Italy, see her site at www.tlcwritingtours.com, or email her at teresa_intrepid@yahoo.com.